Karen came to us for a second opinion on her cosmetic case. She was at the end of her orthodontic treatment and was interested in improving her smile. Karen is a very sweet, pretty lady who lacked confidence in her smile. Karen’s case was more complex than most. Due to severe wear, her facial profile was somewhat shortened, her teeth were too short, and her smile was too narrow. In Karen’s case we ended up needing full mouth reconstruction to get her back to her natural vertical dimension, and complete her smile with the proper size, proportions and color. Karen now smiles more freely and looks incredible. 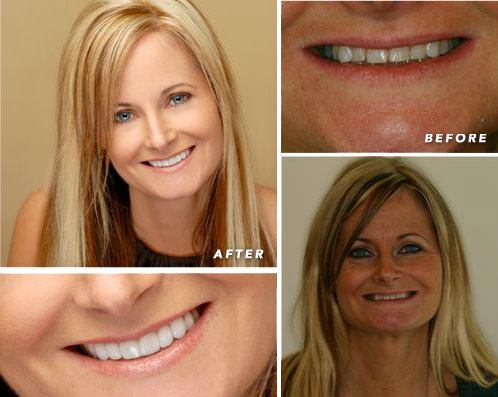 We were able to lengthen the teeth, broaden her smile, and add to her facial beauty. With many cosmetic cases, once the smile is complete, it aids in making other facial features more prominent and noticeable. In Karen’s case, the color selection of the teeth help make her beautiful blue eyes stand out more than ever before. I am truly blessed by the service, attention, and detail that I received with Dr. Gombert and his entire staff. I started my treatment at another dental office where the staff was stressed and unprofessional. I wasn’t comfortable, but I had been with them for a couple of years while I was wearing braces. I ran into a client of Dr. Gombert’s and her smile was beautiful! I was very impressed. Meanwhile, the office I was with kept increasing the cost of my treatment. So I decided to go in for a consultation with Dr. Gombert. From the moment I walked in, I felt comfortable. Dr. Gombert and his staff truly cared. I decided to do the treatment with Parkside Dental. He was always concerned about perfection. The results are amazing! I’ve always been a happy person, but now I can truly smile with confidence. I don’t have to hide my joy, I smile big!! My friends and family are very impressed with the outcome as I am. I truly want to Thank Dr. Gombert and his staff for putting this beautiful smile on my face.